Well, I really should be eating lunch right now, but I'm a little full from sampling the cinnamon buns I made this morning:) Which just goes to show you the blessing/curse of twitter: thanks to Jenni's photos of her cinnamon buns earlier this week, I couldn't help but whip up my own batch! So instead of eating nourishing food, I bring you a new layout! 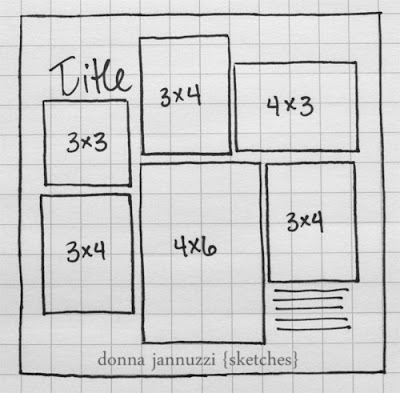 I created this for Donna Jannuzzi's Stretch your Sketches series on the Ella blog! Check out the blog regularly to see more sketches and interpretations! 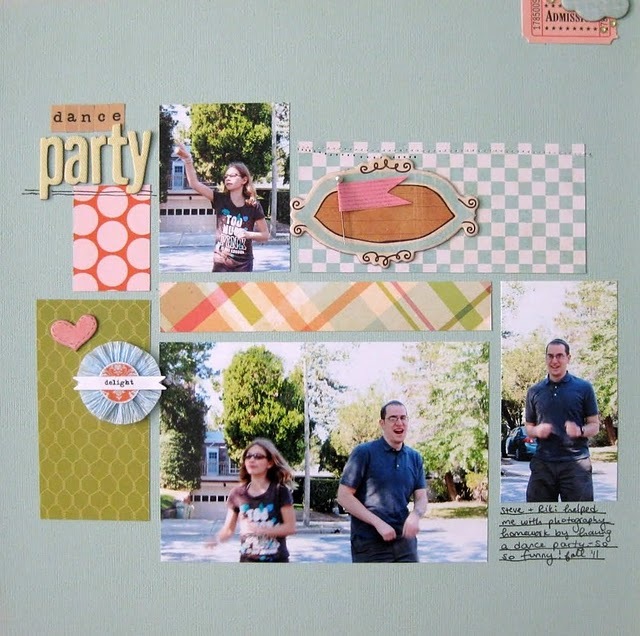 I switched out several of the photos for patterned paper blocks, and added little embellishments. Papers + embellishments are from the Lawn Party Studio Calico kit! The photos are from an impomptu dance party I staged with S and my sister, Riki, in order to practice my shutter speed skills:) As you can see, they were very enthusiastic participants! And since I'm always looking for more dessert ideas (May that continue for the rest of my life--amen.) can YOU tell me your favorite dessert? I so like what you did with that sketch. Love the colors and the simple clean look with still that many photos. Love your version on the sketch. And am so jealous of the cinnamon buns, now you're gonna make me go make some. Love the layout! Very fun Keshet! I think I need to come to your house for some cinnamon rolls-they sound delicious! My staple dessert is a super easy one-brownie trifle. Brownies, chocolate mousse and whip cream layered together-yum!! Love your page Keshet! In the summer my favorite dessert is ice cream or a fruit parfait. a really good quality vanilla ice cream with real maple syrup! See ya Wed. in Blogland! great page...i love that sketch. i'm going to try it out this weekend! Love love how you used that sketch! Great LO. My fave dessert is Mango Key-Lime Cheesecake. To. Die. For.! With a coconut macaroon crust! Gorgeous layout! Fun photos. I love starting with a sketch. I try to avoid dessert as much as possible but if I do indulge, I'm happy with chocolate chip cookies! What a fun dance party! Cute layout! Love the soft colors and fun embellies!!! 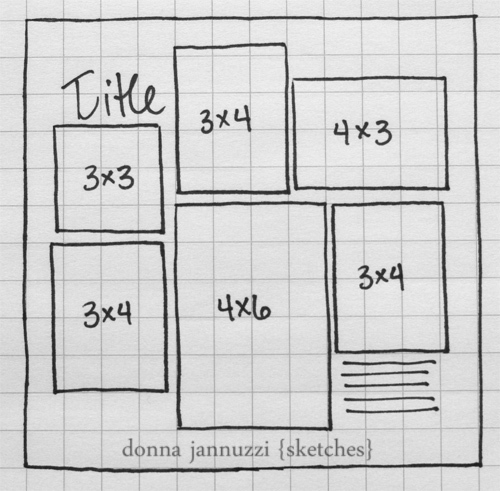 What fun pictures - love what you did with Donna's sketch. I have a lot of favorite desserts but my fave to bake is Butterfinger Cake - extremely rich and chocolately :) I don't make it often because I can not control myself when it is in the house. Cute, cute! Love the little ticket and hint of a cloud at the top! Cinnamon buns sound fantastic! Love your take on the sketch. My fav dessert is warm homemade brownies with frozen yogurt on top! What a fun layout. I like your take on the sketch.